The lighting industry is moving from a products-based one, to being services-based, says a senior Hong Kong-based executive with Philips Lighting. 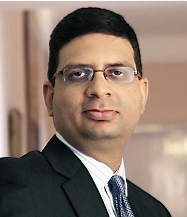 That shift is integral to the aspirations of Hong Kong and other Asian conurbations to achieve “smart city” status not only in terms of energy saving, but in terms of improving the quality of urban living in public and private spaces, stated Nirupam Sahay, Senior Vice President and Global Business Leader, Consumer Lamps, for Philips Lighting, in an interview with Innovation Hong Kong. “A lot of cities around the world have said they want to be smart cities, including Hong Kong, Singapore and a lot of other Asian cities. Lighting is just one part of that overall move to a smart city,” he told us. From selling products such as the lamps that go into street lights, offices and homes, and then letting the buyer manage use of the product, Philips Lighting has “moved to selling systems and services, and now into the ‘Internet of Things’,” Mr Sahay explained. One example is the group’s platform InterAct City, that allows thousands of street lighting poles to be controlled via a computer screen. “For example, if the entire city of Hong Kong has say 40,000 LED [light-emitting diode] street poles, they can all be controlled from a single access point, via a dashboard, and you can monitor which light is working and which is not; you can remotely switch a light on and off, because you see a lot of wastage where lights are still on” in daylight, said Mr Sahay. The profound shift of the lighting business from products to services has been driven partly by technological changes within the industry itself. These include the inexorable shift – often via governmental bans – from the incandescent light bulbs that would still be familiar to British scientist Humphry Davy and American entrepreneur Thomas Edison were they alive today; through to more energy-efficient compact fluorescent lamps (CFL), and recently, more versatile and event more energy-efficient LED technology. This move has coincided with the growth in the use among consumers of portable devices, software apps and artificial intelligence. Philips Lighting is acknowledging at corporate level this societal shift, with a proposal to change its name to “Signify”. The plan was due to be put to a vote of shareholders at the annual general meeting of the Eindhoven, Netherlands-based group on May 15. The global consumer brand Philips is not affected by the change. 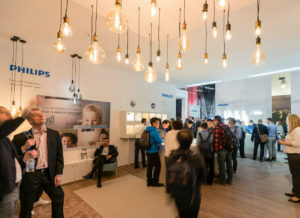 According to the March press release announcing the planned name change for Philips Lighting, the group had in 2017 sales valued at EUR7.0 billion (HKD67.4 billion) and has approximately 32,000 employees in more than 70 countries. Mr Sahay’s Consumer Lamps business represents the legacy part of the group’s activities – conventional light bulbs, halogen and CFL – but he is nonetheless enthusiastic about the overall direction of the sector. “For conventional lamps, the market is declining. So our job is to gain market share and continue to grow profitability in a shrinking market. Growth is happening in LED, systems and services,” he told us. Consumer interest in the look of traditional light bulbs remains. 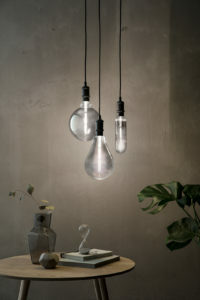 In recognition of this, Philips Lighting has a product range called Deco LED that looks like it uses incandescent technology, but in fact uses LED filaments. The group launched LiFi in March, at this year’s Light+Building trade exhibition in Frankfurt am Main, Germany. It is said to offer clients Internet broadband up to a speed of 30 megabits per second, using light waves rather than conventional wireless technology. “The advantage of that is security, because it requires line of sight” for the signal, Mr Sahay explained. “When you are in the room, or in the office, then you will be connected, but someone outside can’t be connected uninvited. With Wi-Fi there’s always the danger of someone hacking in,” he stated. 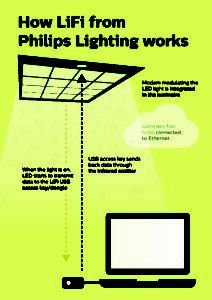 Philips Lighting is piloting the product in the office of a French company, the executive noted. One of the key differences between CFL and LED is the flexibility of the latter, including the fact LED light can be dimmed, and can be converted – via digital command – to a variety of different colours and into sequences or patterns. The group’s InterAct Office services suite for workplaces can range, says Mr Sahay, from “something as simple as having sensors” to detect whether someone is in a room or not, so a light can be switched on or off automatically, to people being able to control – via an app – the quality of light in a workspace. The group’s Indoor Positioning suite of services uses geolocation, via an app interface, to activate an illuminated route for a consumer to get to a particular product in a store. It has been introduced with the French supermarket retailer Carrefour, and in a retail chain in the United Arab Emirates, said Mr Sahay. “When you walk into a store, through what we call visible light communication with an app, you input the name of the item that you want, and the light stock will guide you to the place where the item is, instead of you searching for it in the aisles,” he explained. The group also offers InterAct Arena for sports stadiums. Clients include Chelsea Football Club for its Stamford Bridge ground in London, in the United Kingdom, and the Allianz Arena, home to FC Bayern Munich, in Munich, Germany. Philips Hue offers services primarily for the home, and that are connected to an app on the customer’s smartphone or tablet. Philips Hue can also be integrated with artificial intelligence programmes, in order to accept voice commands from the user. “You can control multiple lamps at the same time. You can change the colours simultaneously of all the lamps – you can have them doing a disco if you want – you can have them synched to movies and gaming,” stated Mr Sahay. The group has additionally launched Philips Hue for outdoor lighting. “We are also embedding lighting into things like carpets, ceilings,” noted the executive. “The ceilings themselves emit light, so you don’t need luminaires then,” he added, referring to an industry term for an integral electric lighting unit. “We don’t make carpets and we don’t make ceilings, but we are partnering with people to produce those products,” he explained. “There are a lot of extremely interesting things that lighting can do, that even five years ago didn’t seem possible,” noted the Philips Lighting executive.